Exclusive Motorcycle Transport. Big Boy scooter on its way to Aggeneys in the Northern Cape.We offer an exclusive personalised service for clients who require their bikes transported within strict deadlines. This means also cross border transport, tour groups and clients catching flights etc. We will in these cases offer an exclusive service whereby we collect only the clients bike(s) and transport the bike exclusively to the clients required destination by the time the client stipulates. In most cases from collection to delivery can be achieved within 24 hrs. 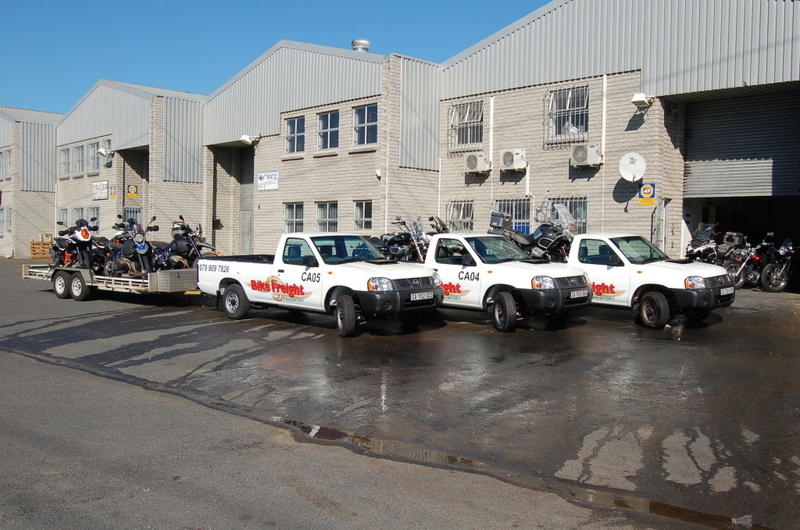 We transport all makes and types of motorcycles all over SA and Namibia, Botswana and Zambia door to door. Our trucks leave Cape Town around mid week depending on the load and the route. Travelling up the Garden Route to East London with stops on the way in all the major centres. Then either up to Bloemfontein or Durban then onto Johannesburg. We normally spend two days in JHB delivering and collecting stock then head back to Durban and the Garden Route back to Cape Town. We also do Namibia, Botswana and Zambia when bookings dictate. This is done on an exclusive rate for that specific customer and normally takes two days for the round trip from Cape Town to Windhoek or Gaborone or Livingstone and back to Cape Town. Because it is a specific trip for a specific customer we can adhere to specific dates and times within reason.